Jacqueline Fernandez, who is currently on a World Tour for Dabangg reloaded, took some time off her busy schedule to take a trip to Disney Land. The actress looked adorable in a white coloured co-ord trouser set and a Disney staple, Minnie Mouse headband teamed it up with a waist fanny pack like a boss! 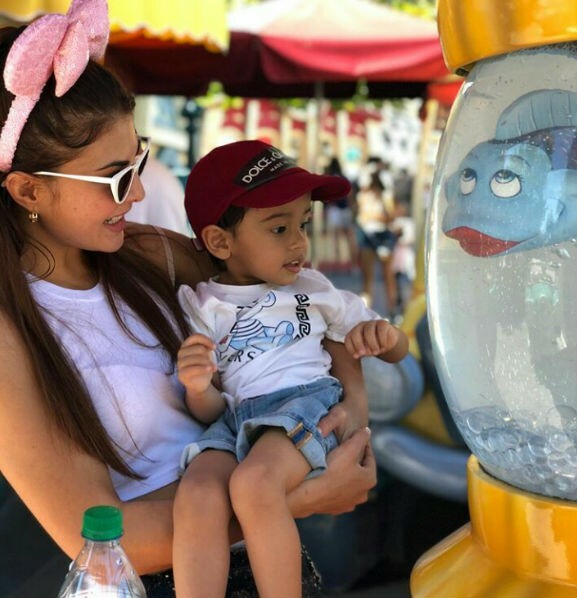 Jacqueline filled up her Instagram stories with memories from Disneyland, which were too cute to handle as she was seen having fun with her Race 3 co-star Salman Khan's nephew Ahil. Sharing frame-worthy photos from the trip, Jacqueline wrote: "When on tour be a tourist. My second Disney with this little cutie Ahil, thanks!" Jacqueline has been leaving no stone unturned in treating the audience with her power-packed performance at the Dabangg Tour a testimony of which was witnessed on her social media. From Yaar Na Mile to Oonchi Hai Building the actress slayed with her sensuous performance. Dabangg tour will see Jacqueline perform to some of the electrifying chartbusters which will prove to be a visual delight for all the fans out there. The actress will be travelling to different countries during her 21 days Dabangg tour schedule.